There are two schools of thought in the world of statistics, the frequentist perspective and the Bayesian perspective. At the core of the Bayesian perspective is the idea of representing your beliefs about something using the language of probability, collecting some data, then updating your beliefs based on the evidence contained in the data. This provides a convenient way of implementing the scientific method for learning about the world we live in. Bayesian statistics is increasingly popular due to recent improvements in computation, the ability to fit a wide range of models and to produce intuitive interpretations of the results. 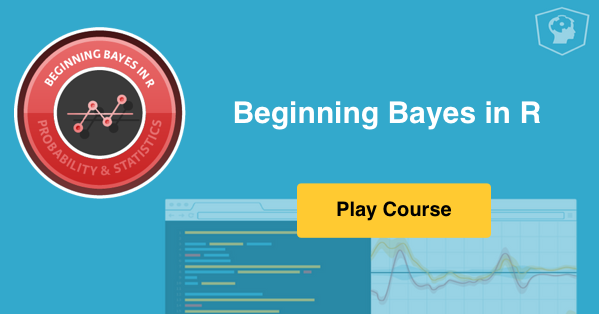 Beginning Bayes in R features interactive exercises that combine high-quality video, in-browser coding, and gamification for an engaging learning experience that will make you a master bayesian statistics in R! Chapter 1 introduces the idea of discrete probability models and Bayesian learning. You'll express your opinion about plausible models by defining a prior probability distribution, you'll observe new information, and then, you'll update your opinion about the models by applying Bayes' theorem. Start the first chapter for free. Chapter 2 describes learning about a population proportion using discrete and continuous models. You'll use a beta curve to represent prior opinion about the proportion, take a sample and observe the number of successes and failures, and construct a beta posterior curve that combines both the information in the prior and in the sample. You'll then use the beta posterior curve to draw inferences about the population proportion. Chapter 3 introduces Bayesian learning about a population mean. You'll sample from a normal population with an unknown mean and a known standard deviation, construct a normal prior to reflect your opinion about the location of the mean before sampling and see that the posterior distribution also has a normal form with updated values of the mean and standard deviation. You'll also get more practice drawing inferences from the posterior distribution, only this time, about a population mean. Finally, suppose you're interested in comparing proportions from two populations. You take a random sample from each population and you want to learn about the difference in proportions. Chapter 4 will illustrate the use of discrete and continuous priors to do this kind of inference. You'll use a Bayesian regression approach to learn about a mean or the difference in means when the sampling standard deviation is unknown. Enjoy!